Get ready to say HELLO to a sweet deal today! 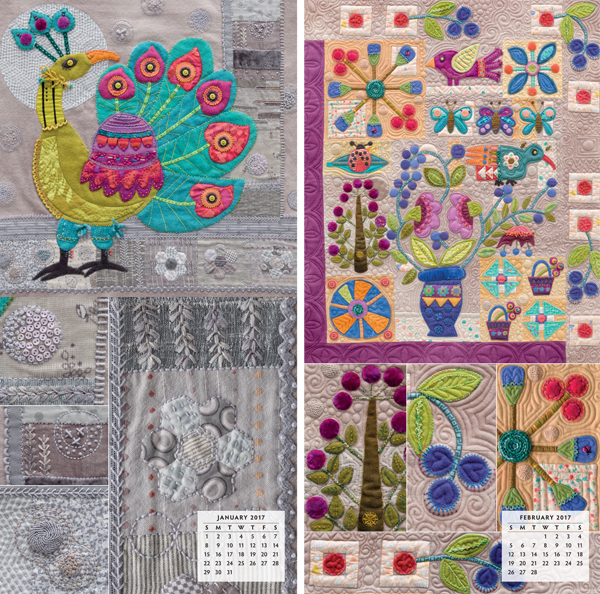 You’ve probably seen peeks of the stunning images inside Sue Spargo’s Stitches to Savor 2017 calendar online. And today you can own Sue’s jaw-droppingly gorgeous calendar for 50% off the retail price. Steal this deal for just $11.49—HALF OFF the retail price. Because Sue’s calendar is a time-sensitive item, the rest of our (quickly shrinking) inventory must be sold now. 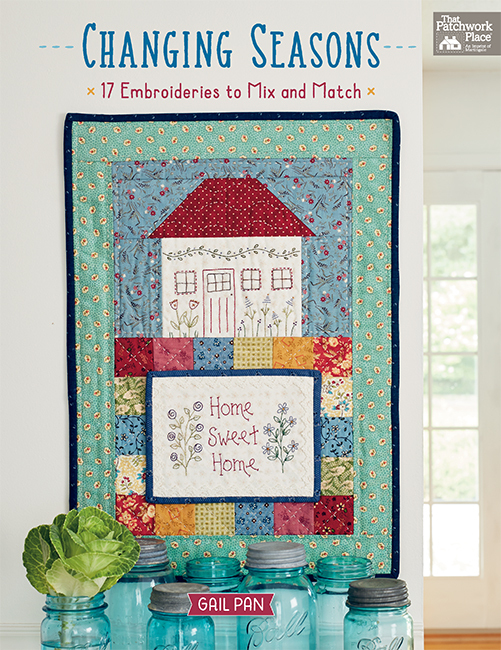 Imagine stopping to glance at your calendar during a busy day, just to take a calming breath and marvel at Sue’s hand-sewn works of art. We took a break almost every day in 2016 to do just that in the office—and we can’t wait to do it again in 2017! 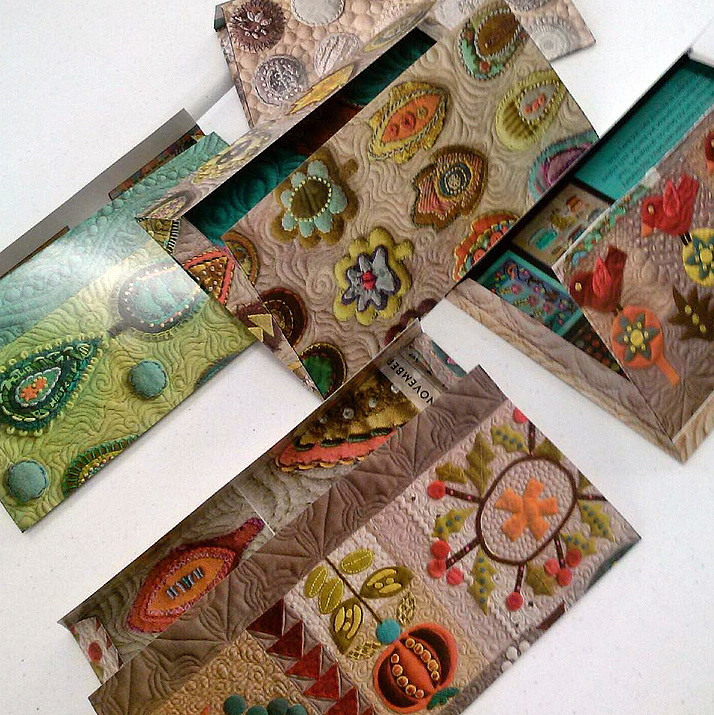 Check out the cool envelopes that Sue Spargo fan Barbara Quinby made from pages of Sue’s 2016 calendar! 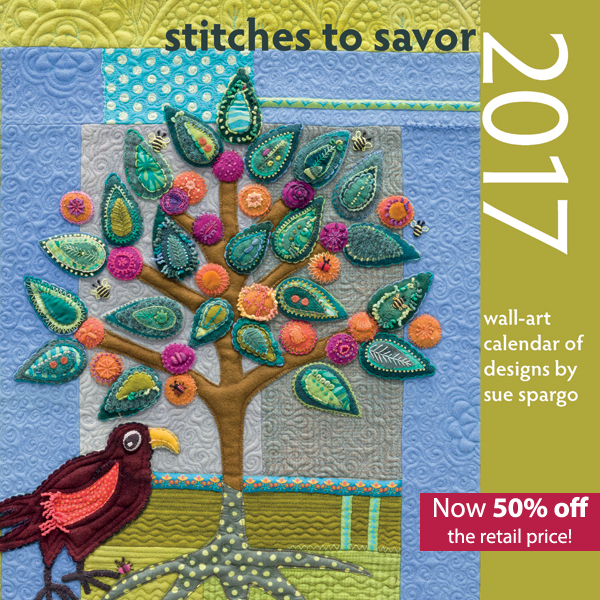 A very limited supply of the Stitches to Savor 2017: Wall-Art Calendar of Designs by Sue Spargo is left—don’t miss your chance to own it! Here’s where you can order yours. 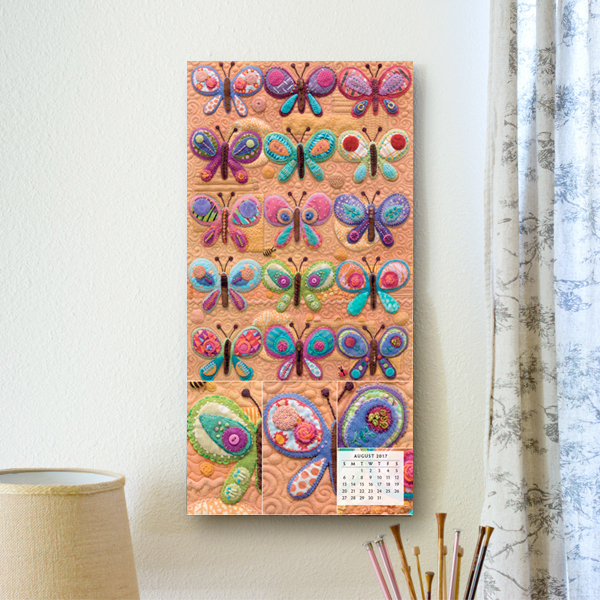 The dazzling birds alone make the calendar worth every penny, don’t you agree? 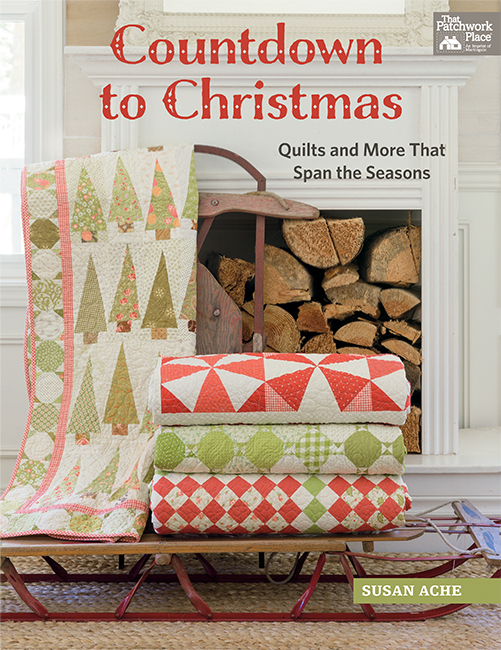 What are you looking forward to in 2017: joining a quilt-along, starting (or completing!) a special quilt, hitting every stop on a shop hop? Tell us in the comments! I am setting my intentions towards achieving a balance in my life – work, creativity (mostly quilting, family, friends, and spiritual well-being (also related to quilting!). I am looking forward to making quilt labels with the story of the quilt and a picture of the maker, for the elderly people in our church. I want them to be able to pass down the stories of their prized old quilts to future generations. I will finish "Farm Girl." My husband is retiring at the end of February. After 35 years away we are moving back to our home state of Illinois. We will be able to spend more time with our elderly parents. We are really looking forward to this new phase of our lives. The plan is to move close to my sister and brother-in-law. 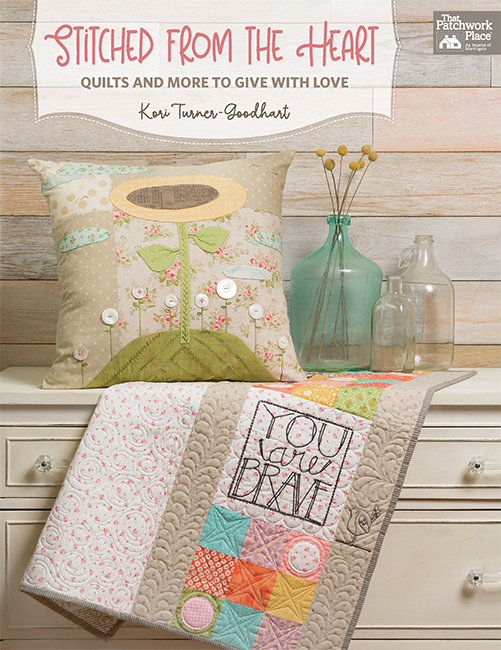 Hopefully, we will motivate each other to do lots of quilting. I love joining quilt-alongs and hope to find several to join this year since I have retired (again). Joining a quilt along. Our guild is going to have a mystery quilt, and although I am usually hesitant to do these because I like to KNOW what I am making – I am trying to quilt "outside the box" and do this mystery quilt with my group! I am looking to get more organized in 2017 so I can match time available up with unfinished or new projects. I also haven’t been to a major show in a number of years so I am already thinking ahead to attending one. I always get so inspired by the entries in the exhibits. The retail therapy doesn’t hurt either. I need some motivation to get more quilting done. Am joining a group of a few to discuss quilting and to pick each others brains! I’m moving my quilt studio in the next few weeks, so getting that organized is the first item on my list. I’d love to attend a large quilt show, haven’t been in quite a while. Also have a new granddaughter coming in the spring….so I must get at least one quilt finished for her. Also hope to join and complete the mini quilt challenges from my online group. I am trying to not buy more fabric and cleaning my sewing space. Hoping to finish a quilt for my niece’s husband featuring his favorite things. My goal is to complete 7 quilts for my siblings and surprise them at Christmas. The first one I have started quilting, so only 6 more to go!